Is this another system error? The BBC is reporting it down. Yet all other indices are up. Has something big in France suddenly gone pear shaped? Looks like a bad print. Not showing up elsewhere that I can see. The chart at the BBC has a very big U on it. 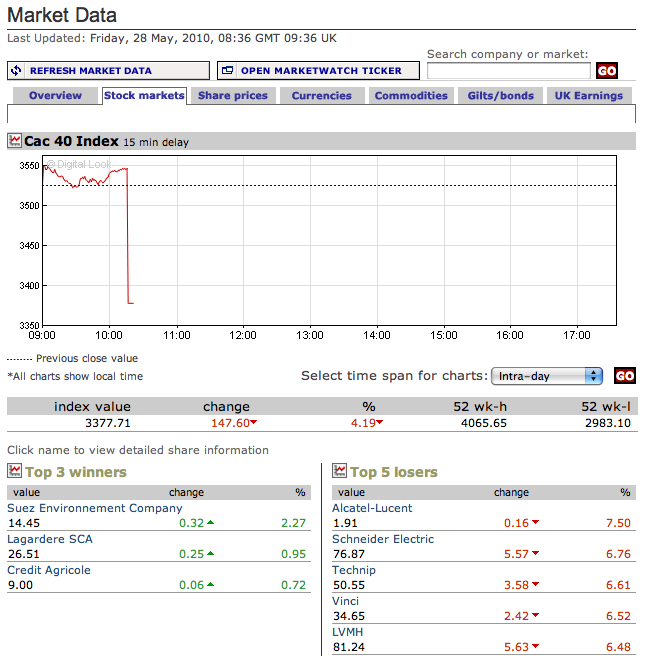 Looks like all the market makers took a dump at 10.15 for exactly 30 mins. Maybe they were all out together last night at the same Indian. Anyone know what happened here? Did the BBC get fed some dodgy data? I bought a lawnmower from Argos about this time. BTW the link is only 3 hours old maybe the BBC have got things wrong ?